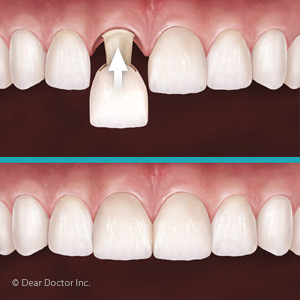 Restoring missing or unattractive teeth can often be a lengthy process. Months may elapse between initial teeth preparation and final placement to allow time for tissue healing and permanent crown manufacturing. During that period you will likely wear temporary (provisional) crowns to protect the teeth while improving function and appearance. In the past, provisional crowns were fairly uniform. Today, though, there are provisional crowns available that conform exactly to a patient’s individual mouth. These crowns not only enhance function and appearance, they’re an excellent way to “try out” your new smile before the permanent restoration. Customized provisional crowns are part of a concept known as “smile analysis.” A new smile involves more than restoring affected teeth: we also consider the overall health of your mouth, the shape of your face, and your own desires and expectations. Your final smile design is a joint collaboration between you, our office and the dental laboratory that will fashion the final restoration. There are a number of techniques for creating customized provisional crowns. Some techniques involve bonding tooth-colored materials like composite resin directly to the teeth. Others use impression models of your teeth to create an outline or shell that’s filled with an acrylic material and then affixed to your teeth. The aim with any of these techniques is to produce a provisional crown that accurately reflects the final crown’s appearance. With these types of provisional crowns, we can see how the new teeth will look (their color, shading, shapes and proportions) against the gums, and if they appear to be in balance and harmony with the entire face, including your lips, jaws and facial contour. We can also evaluate how well the new teeth function as you chew, speak or smile. It takes some extra effort to prepare customized provisional crowns rather than the more uniform version. But this effort is well worth it: by helping us anticipate more accurately how your new restorations will appear and function, customized crowns help ensure your new smile is an attractive and satisfying one.